the genus aglaonema belongs to the araceae family and contains about 40 species. some of them are popular houseplants or used as office plants because they tolerate some poor conditions. but if you like to have a healthy and beauitful plant, give it some care. they are native to the tropical asia. the chinese evergreen (aglaonema crispum) is available in a lot of varieties with silver or light green variegated leaves. aglaonema crispum is tolerating low light but does best if located bright without direct sun. the variegated cultivars will need low to moderate light otherwise they can produce solid green leaves. the chinese evergreen can be grown in a good regular potting mix. keep it constantly moist but not wet, sitting in water can cause rot. a moderate drying between the waterings is ok, but the soil shouldn’t dry completely. a half diluted water soluble fertilizer can be given monthly in spring/summer and every six to eight weeks in fall/winter. new bought or recently repotted plants don’t need to be fed for the first six to eight weeks. aglaonema crispum likes it warm (20-25 °c/68-77 °f) and needs a winter minimum of 14 °c/57 °c. a high humidty is welcome but not needed. spraying it over with water keeps its leaves free from dust. aglaonema crispum can be propagated with cuttings or by division. the native to brazil calathea crocata is commonly known as eternal flame. 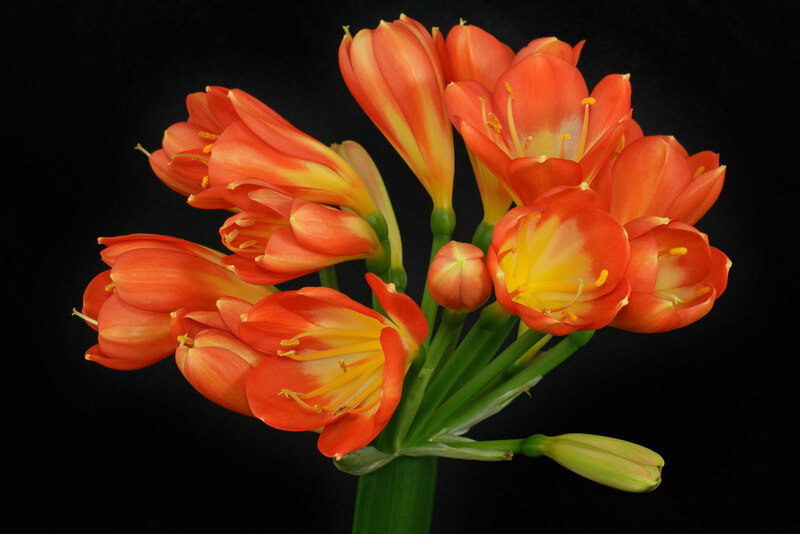 its puckered ribbed leaves have maroon undersides, the flowers are orange/yellow. during the night it closes up the leaves. the eternal flame (calathea crocata) can be placed from bright to light shaded without afternoon sun (to avoid leaf burn). some morning and/or evening sun will be tolerated. a good regular potting mix can be used. it has to be kept evenly moist but not wet. sitting in water can cause rot. the drying of the soil’s surface between the waterings is ok, but it shouldn’t dry completely. a water soluble fertilizer at half strenght can be given monthly in spring/summer and every six to eight weeks in fall/winter. 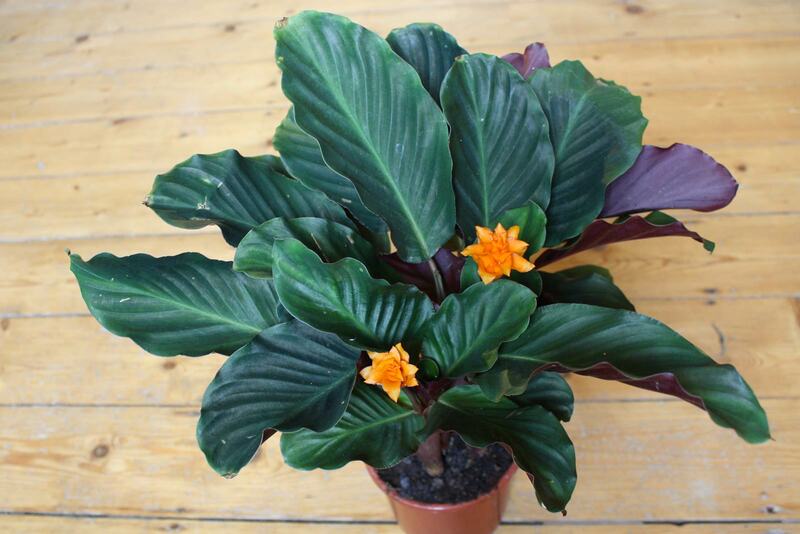 spraying calathea crocata over with water regularly increases humidity and keeps its leaves dust free. it likes room temperature round the year and needs a winter minimum of 15 °c/59 °f. for blooming some weeks of total darkness for 12-14 hours every day can be helpful. calathea crocata can be propagated by division. peperomia magnoliifolia is commonly known as spoonleaf peperomia. there are cultivars with yellow/red edges (cv. “tricolor”) or creme variegated leaves (cv. “green & gold”) available. peperomia magnoliifolia is doing best if located bright without afternoon sun. some morning and/or evening sun will be tolerated. but it can also be grown on a light shaded position. for producing its colorful fooliage the variegated cultivars need to be placed in bright light. otherwise they are showing green leaves. the spoon leaf peperomia likes room temperature the year round, with a winter minimum of approx. 15 °c/59 °f. at this temperature range, watering can be reduced and there is no need to feed. a high humidity is welcome. spraying it over with water from time to time keeps its leaves free from dust. peperomia magnoliifolia can be propagated with cuttings.